You are here: Home / Finding gold / Finding gold is fun! When life says you need a break, see why finding gold is fun for a change! When my family was in need of a break from our hectic life experiences, I recalled a vacation I once took with my parents long ago in the ’49er gold rush country of California. It was a fun time and relaxing. I also remember finding my first gold. How exciting it was to see that tiny vial with a handful of little gold flakes. Finding gold is fun! Prospecting is something so simple yet so radically different. The gold flakes would actually clink in the bottom of the glass tube when I would shake it back and forth, clink-clink. An unusually loud sound for such a small object. I still recall hearing it and how puzzling it seemed, having never held anything quite as dense as pure yellow gold before. I also remember discovering a bit about my family heritage too. We went to visit my great grandfather’s gold claim in Grizzly flats California. I had no idea the gold prospecting was in my blood up until that point. Pretty neat to find something like gold discovery in the roots of your family tree. So off we went to look up places in the Mother Lode Gold country near Columbia California. Places that we could take the family as stressed out as it was. I needed to break from the day-to-day high-tech work I was in and go take time with the family for rest and adventure. HINT: The secret of why I seek gold is, to let the adventure of the hunt take me along for the fun of it. The valuable gold found is just a desirable outcome of all that fun diversion activity. Pretty cool stuff. I had to learn this concept though, it didn’t just occur to me… I needed to be mentored in this concept of just how to experience hunting for gold as fun. 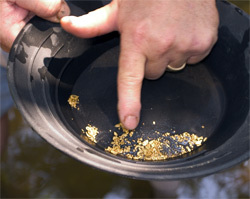 In one of the gold prospecting locations by Columbia we discovered a seasoned gold prospector named Joshua. Not to be confused with my son Josh. Joshua the veteran prospector really believed that gold prospecting is fun! His actions showed it. You see Joshua was a one-of-a-kind, the real deal. He grew up near his granddad’s gold claim he and the family lived right there. An opportunity to be mentored on gold not just for myself but my family too. 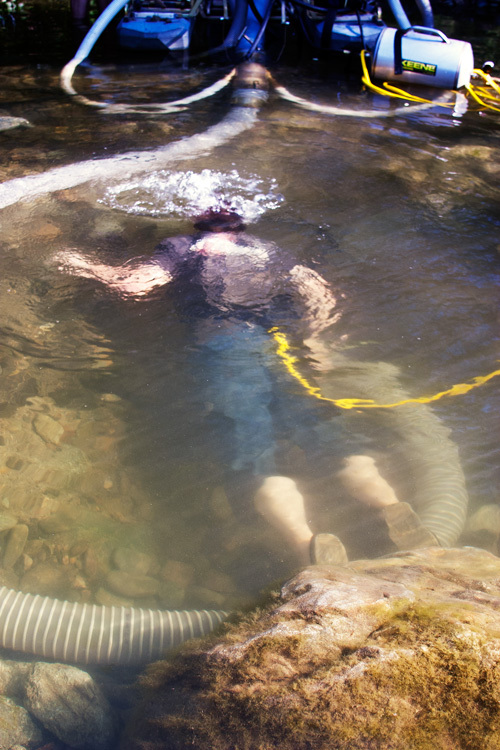 Joshua introduced us to many secrets of successful gold prospecting. Surprisingly some of those secrets are pretty obvious and yet people don’t see them because they’re hiding in plain sight. For example it’s not uncommon for tall cottonwood trees to the found in the middle of a stream bed with no apparent place to anchor themselves against the floods of winter. The cottonwood tree will make its own anchor by drilling down roots and cracking the bedrock itself. Those extended cracks can make fantastic gold concentrating traps like a natural sluice box. Right there in the open standing tall in front of you is a giant biological pointer to potential gold. Who would’ve thought, here lies gold concentrated in cracks for you to investigate? Joshua also had an interesting way of making the business of hunting for gold a lot more fun too! It was under his skillful gold finding talent that we apprenticed. To learn the detailed process behind how to successfully hunt down and find gold over and over again. Little observations of the Creek bed and color of the rocks, along with textures and the little probability thrown in for good measure. The guy really knew what he was doing. By showing me the little details that went along with my college geology background Joshua was able to give me tremendous insight that only experience in the field of gold prospecting with someone who’s been there and done that would be able to. Over the years his family and ours became close friends and would often share exciting stories and pictures of our most recent gold finds. A legacy of gold prospecting and history. Sadly, on Christmas Eve 2007 I found out that Joshua had a tragic and mysterious incident in which he had died. Out of respect to Joshua and his family I won’t go into the details. He meant that much to us and his family still does. So much of what I give you in the way of prospecting knowledge comes not only from my own life experience but by extension through my apprenticeship with him it comes from Joshua as well. I have never met another gold prospector quite like him, and I suspect I never will. He was one of those individuals you look back on later and say I’m glad we crossed paths. Sometimes the real adventure in life is happening right where you are right now. You won’t even know it until you look back. I see life is a gift of God for which I am grateful to live along with others whose path crosses mine. Each of us has a greater purpose, though sometimes we don’t know what it is. Whatever gold finding legacy Joshua left me and whatever prospecting knowledge he had, I will do my best to share with you along with my own experience as you join me in the fun adventure of hunting for and finding gold. Prospector Jess: Thank you for this fun article. I live in Phoenix and was looking for information linking cottonwood trees (specifically the Fremont cottonwood) to gold and streams for a blog post. I found it here through one of the first links in Google. Keep up the great work and I will check back! Firstly, I would like to say to you that what you have said about the old “Prospector Joshua” and Your really seeing the outstanding beauty of another human being’s soul and that person’s influence on your life was more valuable than “the innate gold itself! Your story sums up to others viewing your website that we all are, therefore, the “sum total” of all the people who God has created and whose lives have come before us to influence good in our path to Eternity. #1. A cylinder magnet for beginning gold mining such as you show in your videos? #2. A reliable inexpensive metal detector to begin using in searching for gold? 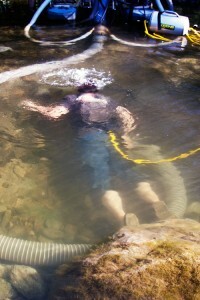 Your YouTube video website is the most “professional” of all the gold prospecting videos! All the other videos on YouTube are very inferior in comparison! go down worth of the river from that mine , which it be close for while? How do u register on your website? See the various free reports to get an account for the site in addition to the report of free video. Simply submit your best email address for us to send access info to. You will be contacted with our updates and news too.